This report tells stories of research at Nebraska, where talented, creative people are making an impact on our world. Nebraska researchers’ work is changing lives, creating new businesses, informing social policy, enlarging perceptions of the world, transforming institutions and providing students with intensive research experiences that prepare them for jobs of the future. Our faculty are published in top journals, cited by their peers and recognized with prestigious awards. In 2016, computer scientist Mehmet Can Vuran was named to Clarivate Analytics’ Highly Cited Researchers list for a third consecutive year, an honor for authors who rank among the top 1 percent of most-cited works in their field. Agronomist Kenneth Cassman won the 2017 Bertebos Prize from the Swedish Academy of Sciences for his key role in developing the concept of ecological intensification of agricultural production. The impact of research at Nebraska is evident in virologist Charles Wood’s 20 years of work in Zambia, where he and colleagues built an internationally recognized research and clinical laboratory that will continue life-changing research on HIV/AIDS and associated diseases far into the future. We are confident that our continued pursuit of excellence and investment in faculty will sustain this momentum. At other times, the impact is immediate. An in-depth reporting project produced by 11 undergraduate journalists brought national attention to the consequences of alcohol sales in Whiteclay, Nebraska, a decades-long issue that has decimated Native American lives. University startups are sparking growth at Nebraska Innovation Campus, our public-private research campus. Entrepreneurship is one reason the Milken Institute ranked the University of Nebraska system 35th among 225 institutions for technology transfer. 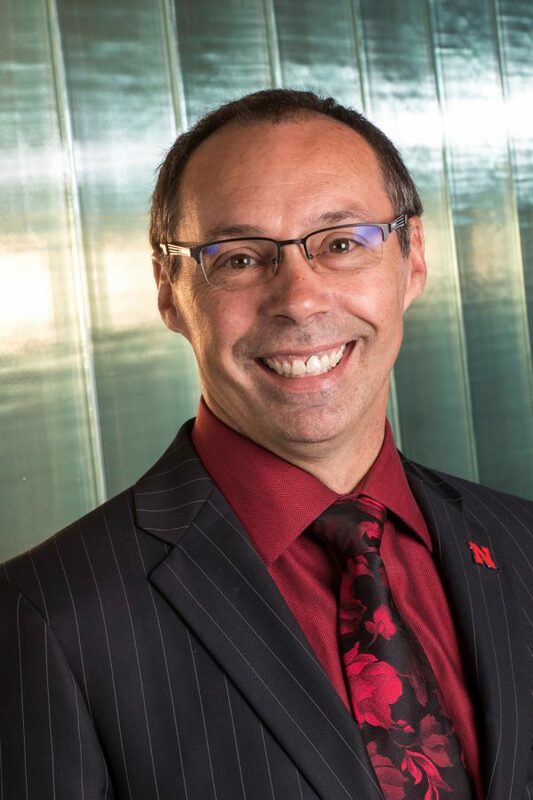 NUtech Ventures, the University of Nebraska-Lincoln’s technology transfer and commercialization affiliate, works closely with NIC to commercialize faculty research and support faculty and staff startups. At Nebraska, our faculty is our greatest resource. Strategic hiring initiatives over the past five years have expanded the university’s expertise in high-impact areas and enhanced research infrastructure. Most exciting is a 24 percent increase in early career tenure-track faculty since 2012. They are our future, and it looks bright. Leadership is another key resource. Donde Plowman and Michael Boehm, two leaders who started new roles in January, are energizing the campus with their enthusiasm and experience. Plowman is executive vice chancellor and chief academic officer after serving as College of Business dean for more than six years. Boehm is Harlan Vice Chancellor for the Institute of Agriculture and Natural Resources and University of Nebraska vice president for Agriculture and Natural Resources, joining Nebraska from The Ohio State University. This report covers a fraction of the innovative work that drives Nebraska’s research growth, with 2016 research expenditures totaling $295 million, and garners recognition and awards for creativity and scholarship. Great things are happening at Nebraska, and we are confident that our continued pursuit of excellence and investment in faculty will sustain this momentum. Nebraska biologists recently discovered an important component plants need to make microRNAs, tiny molecules critical in regulating gene expression. Despite their vital role, microRNAs are little understood. Bin Yu and colleagues discovered a protein that plays a role in the early stages of microRNA creation. Uncovering new clues improves understanding about how crops respond to droughts and other stressors. The protein is found in humans and other organisms so these findings may help elucidate microRNA processes in other fields. This is the latest of several discoveries by Yu’s team that expand knowledge of microRNAs. Findings appeared in the Proceedings of the National Academy of Sciences. The National Science Foundation helped fund this research. Using modern molecular biology techniques, Nebraska biologist Kristi Montooth and colleagues refuted a long-held theory about how fruit flies developed a high alcohol tolerance. More than two decades ago, scientists hypothesized that an adaptive change in the flies’ alcohol dehydrogenase protein – an enzyme that breaks down alcohol – enabled them to colonize ethanol-rich habitats. But Montooth’s team used genetic engineering to resurrect the protein from fruit flies’ ancestral species and found that changes in the protein did not improve alcohol tolerance. This trait must be due to other genes, Montooth said. Identifying these key pathways in fruit flies may offer clues about human alcohol tolerance. Findings also show that understanding molecular evolution requires more than intuition – scientists must test how changes actually function in an organism. The study, funded in part by the National Science Foundation and the National Institutes of Health, appeared in Nature Ecology and Evolution. Beetles wear a body armor that should weigh them down but actually is surprisingly light. Better understanding beetle exoskeleton properties could help scientists engineer lighter, stronger materials. Revealing exoskeleton architecture at the nanoscale has proven difficult. Mechanical and materials engineer Ruiguo Yang and colleagues developed a way to analyze the fibrous nanostructure in the common figeater beetle. Their technique can be used on other beetles and hard-shelled creatures and might extend to artificial materials with fibrous structures. Comparing beetles with differing demands on their exoskeletons, such as defending against predators, could lead to evolutionary insights and a better understanding of relationships between structural features and properties. The Nebraska team’s findings were featured on the cover of Advanced Functional Materials. The Air Force Office of Scientific Research’s Multidisciplinary University Research Initiative funded this research. Nebraska’s Drone Journalism Lab in the College of Journalism and Mass Communications is a partner in an innovative program to train journalists in using drones for news coverage. The project included three-day workshops in 2017 covering safe drone operation, best practices in drone journalism, legal and ethical issues with hands-on flight training, and information to study for federal drone certification. Online training is available at The Poynter Institute’s News University. The program is a partnership with Poynter, Google News Lab, National Press Photographers Association and drone industry leader DJI. University of Georgia, Syracuse University, University of Wisconsin-Madison and University of Oregon hosted workshops. The nationwide training expands on the 2016 Drone Journalism Boot Camp in Nebraska, which drew 62 national journalists and journalism educators. Nebraska professor of practice Matt Waite launched the Drone Journalism Lab in 2011. Researchers from Nebraska’s Center for Digital Research in the Humanities are identifying and cataloguing variations among the first editions of Walt Whitman’s seminal work, Leaves of Grass. With a $300,000 grant from the National Endowment for the Humanities, Kenneth Price, Hillegass University Professor of American Literature and center co-director, and colleagues are examining at least 20 copies of the original 1855 edition of the book, recording and providing a background on each variation. The team will develop a digital variorum – a collection containing different versions of the text as well as Whitman’s earlier manuscripts connected to Leaves of Grass – as part of the online Walt Whitman Archive. The project is the first to make accessible the significant changes within the first edition. Price’s team aims to make the online tool accessible to as wide an audience as possible. Some Nebraska communities lack sufficient legal services. To strengthen the state’s legal options, a new Nebraska program encourages students from underserved communities to pursue a legal education. Through the Underserved Law Opportunities Program, undergraduate students study at the University of Nebraska Omaha and obtain a legal education at the University of Nebraska College of Law. Students attend special programs, meet with peer mentors and intern with a nonprofit legal organization. The program targets first-generation or bilingual college students with a record of community service who meet minimum grade and admissions test scores. “There is no question that Nebraska has a need for bilingual attorneys and attorneys who will practice law in the public interest. This is an important step toward meeting that need,” said Richard Moberly, Nebraska College of Law dean and Richard and Catherine Schmoker Professor of Law. Heart failure, a leading cause of death, can originate with a virus. But the body’s own immune system sometimes plays a role by attacking heart tissue after the virus is gone. The autoimmune response begins when a virus damages cells, releasing their internal components. Nebraska immunologist Jay Reddy has pinpointed a component that appears to be a target for certain T-cells, front-line defenders against invaders. The T-cells mistake the newly exposed protein as foreign, and the reaction triggers heart inflammation, or myocarditis. The discovery could lead to better diagnosing and treating myocarditis by targeting heart-reactive T-cells, while sparing the rest of the immune system. Reddy worked with a large multidisciplinary Nebraska team that published its findings in The American Journal of Pathology. The National Institutes of Health’s National Heart, Lung and Blood Institute and National Institute of General Medical Sciences funded this research. Growing injection drug abuse in rural America is fueling the spread of HIV and hepatitis C. Syringe exchange programs reduce disease transmission by providing clean injection supplies and education, but sociologists in Nebraska’s Research, Evaluation and Analysis for Community Health Lab found access to such programs may be limited in rural areas. The study assessed these programs in rural and urban Puerto Rico, which saw an explosion of HIV and hepatitis C a decade ago. Research showed 79 percent of urban drug users took advantage of the programs in the previous year compared to 58 percent of rural users. More urban than rural users also talked with an outreach worker about preventing disease spread. Melissa Welch-Lazoritz, REACH Lab project director, said U.S. states may need to expand rural access to clean needle programs to prevent epidemics. The study, funded by the National Institutes of Health’s National Institute on Drug Abuse, appeared in the International Journal of Drug Policy. Nebraska leads an international effort to increase wheat yields and help feed a growing global population. The project aims to develop hybrid wheat lines that boost yields and climate resiliency through breeding. “With new genetic and chemical tools available … we think the time is right to attempt to create a viable hybrid wheat market again,” said agronomist Stephen Baenziger, Nebraska Wheat Growers Presidential Chair, who leads the project. Plans include developing a public foundation for hybrid wheat research and creating hybrid seed on a commercial scale. Collaborators include Texas A&M University, Kansas State University and the International Maize and Wheat Improvement Center (CIMMYT). The U.S. Department of Agriculture’s National Institute of Food and Agriculture funds this three-year project. It’s part of the U.S. contribution to the International Wheat Yield Partnership, a consortium of public and private partners. Gender norms, stereotypes and friendships all play a role in curbing middle school girls’ interest in science, a team of Nebraska sociologists found. A survey of 444 middle school students showed girls and boys had similar comprehension and grades in science. When asked about their friends, both genders were more likely to consider boys as a “science kind of person.” Yet when asked to consider whether that label applied to themselves, both genders answered similarly, indicating that social perceptions about gender influence girls’ career choices. The survey found that girls interested in science are more likely to have close friendships with like-minded girls. The study suggests educators can use inclusive science clubs, presentations from diverse scientists and lessons relating science to students’ everyday interests to encourage girls’ interest in science. The team, co-led by sociologists Patricia Wonch Hill and Robin Gauthier, published its findings in Social Sciences. The National Institutes of Health funded this research. Does a cracked sidewalk, broken window or graffiti make a neighborhood feel less safe? An interdisciplinary Nebraska team aims to find out using sensory assessment tools that measure pedestrians’ physiological responses to environmental conditions. The research provides evidence-based data of perception to augment traditional methods of visual audits and surveys. Construction engineer Changbum Ahn and community and regional planner Yunwoo Nam are teaming for the National Science Foundation-funded project. In the study, GPS-enabled smartphones are synced to motion sensors attached to participants that measure gait stability, walking patterns, heart rate and skin temperature. Physiological data help researchers identify problem areas – for example, if participants’ heart rates, gaits or skin temperatures change when they encounter a pothole. Ultimately, researchers plan to make recommendations for safer, more walkable neighborhoods. Citizens who feel they’ve gained knowledge about government institutions may be more likely to trust those institutions, according to University of Nebraska Public Policy Center research. Trust may grow when people perceive they know more, regardless of whether they actually do. Nebraska psychologists, led by Lisa Pytlik Zillig, gave one group of people specific information about water regulatory agencies. Another group learned about a different agency. Though both groups showed increasing trust in water agencies, members of the first group perceived that they knew more about the agencies and their trust in them was less likely to be affected by overall trust in government. Results suggest institutions can build trust by communicating effectively, building familiarity and treating people fairly. But personality still matters. A person’s natural inclination to trust or mistrust plays a significant role. The National Science Foundation-funded study was published in PLOS One. Companies that receive “comment letters” from the Securities and Exchange Commission tend to increase their tax compliance the following year, according to a study co-authored by Nebraska’s Tom Omer, Delmar Lienemann Sr. Chair of Accounting. The SEC issues these letters to comply with the Sarbanes-Oxley Act of 2002, which requires it to review companies’ financial reports every three years. If filings are deficient or unclear, the SEC requests additional information so investors have access to companies’ financial details. Though the SEC and the Internal Revenue Service do not communicate directly, this research revealed that when a company received a tax-related letter, it increased its provision for income taxes by about 1.4 percentage points and actual cash payments by 1.5 percentage points. In total, comment letters triggered firms to pay up to $3 billion in additional federal, state and foreign government taxes in a year. Findings were published in The Accounting Review. Patrick Dussault, Mary Anne Holmes, Gary Pickard, Robert Powers and Mary Willis were named American Association for the Advancement of Science Fellows in 2016. Dussault, Charles Bessey Professor of Chemistry, was recognized for contributions to the chemistry of organic peroxides. Holmes, emeritus professor of earth and atmospheric sciences, was honored for contributions to combating gender inequity in geoscience and the advancement of science through teaching, administration, research and service. Pickard, professor in the School of Veterinary Medicine and Biomedical Sciences and in the Iowa State University/Nebraska Cooperative Professional Program in Veterinary Medicine, was recognized for contributions to neuroscience. Powers, professor of chemistry, was recognized for contributions to the fields of biological nuclear magnetic resonance and metabolomics. Willis, professor of nutrition and health sciences, was honored for contributions to basic and applied anthropology and the advancement of science through teaching, mentoring and service. Engineer Shane Farritor was named a National Academy of Inventors Fellow in 2016. The distinction is a high honor bestowed on academic inventors whose inventions improve quality of life, spur economic development and benefit society. Farritor, Lederer Professor of Mechanical and Materials Engineering, was recognized for contributions in robotics and sensor systems. He holds 48 patents for surgical devices and railroad technologies. He is co-founder and chief technology officer of Virtual Incision Corp., a medical device company that is developing advanced miniaturized robots for general abdominal surgery procedures. Two faculty members became American Society of Plant Biologists Fellows in 2016. Ed Cahoon, George W. Holmes Professor of Biochemistry and director of the Center for Plant Science Innovation, was selected for contributions to research on plant lipid metabolism aimed at enhancing the nutritional and industrial value of crops. Daniel Schachtman, professor of agronomy and horticulture and director of the Center for Biotechnology, was selected for contributions to research focusing on the interaction between plant roots and soil microbes with the goal of improving crop yields with less water and fertilizer. Kenneth Cassman, emeritus Robert B. Daugherty Professor of Agronomy, won the 2017 Bertebos Prize from the Swedish Academy of Sciences. The biennial honor is awarded by the Royal Swedish Academy of Agriculture and Forestry. Cassman was honored for his key role in developing the concept of ecological intensification of agriculture production. He and colleagues created the Global Yield Gap Atlas, which addresses reducing the gap between current and potential crop yields while minimizing negative environmental impacts. Chemist Xiao Cheng Zeng received the 2017 Surfaces and Interfaces Award from the Royal Society of Chemistry. The annual award honors outstanding and innovative research on the behavior of chemical systems at surfaces or interfaces. Zeng, Chancellor’s University Professor of Chemistry, is the first winner from a university outside Europe. Five Nebraska animal scientists were honored by the American Society of Animal Science in 2017. Archie Clutter, dean of the Agricultural Research Division and professor of animal science, received the Rockefeller Prentice Memorial Award in Animal Breeding and Genetics, which recognizes research excellence in breeding and genetics. Andrea Cupp, Omtvedt Professor of Animal Science, received the Animal Physiology and Endocrinology Award, which honors basic or applied research in physiology and endocrinology. Rick Funston, Nebraska Cow-Calf Professor in Animal Science, won the Animal Management Award, which recognizes basic or applied research in animal behavior, environmental science, economics or other biological or production management. Ronnie Green, chancellor and professor of animal science, earned the Morrison Award, the association’s most prestigious honor. It recognizes research with direct and international importance to livestock production. Lisa Karr, associate professor of animal science, received the Corbin Companion Animal Biology Award, which is given to animal scientists who contribute through teaching, research or service to companion animal nutrition or biology. Three Nebraska faculty received 2017-2018 Core Fulbright U.S. Scholar grants from the Council for International Exchange of Scholars. In South Africa, Dawne Curry, associate professor of history and ethnic studies, will conduct research, write and build scholarly relations between that nation and the U.S. Amelia Montes, associate professor of English and ethnic studies, will teach and collaborate in Serbia with Aleksandra Izgarjan, an expert in gender studies and transnational literature. Anthony Zera, Kate Foster Professor of Biological Sciences, will teach a class on evolutionary endocrinology, conduct research and write review articles in Belgium. Mark Riley, professor of biological systems engineering and associate dean for research in the College of Engineering, was named to the College of Fellows of the American Institute for Medical and Biological Engineering in 2017. Riley was recognized for outstanding contributions to biological engineering through development of noninvasive biological measurements and professional leadership. Two faculty members were named Institute of Electrical and Electronics Engineers Fellows in 2017. Hamid Sharif, Charles J. Vranek Distinguished Professor of Electrical and Computer Engineering, was selected for his work to develop railroad wireless communication. Gregg Rothermel, Dale M. Jensen Chair of Software Engineering, was honored for contributions to software testing and end-user software engineering. Roger Elmore, Heuermann Chair of Agronomy and Horticulture, was named a Fellow of the Crop Science Society of America in 2017. Elmore studies production practices that increase profit by optimizing yields and water use. He co-leads a cover crop research project supported by the Nebraska Soybean Board and the Nebraska Corn Board. marital status, and/or political affiliation in its programs, activities, or employment.